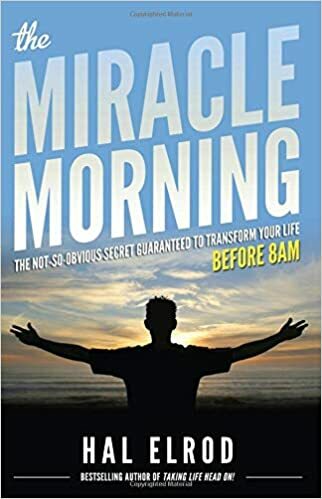 In this book, the author Hal Elrod talks about how waking up early in the morning and then following 6 simple practices transformed his life. The author abbreviates the 6 things in his morning routine as SAVERS. In his 1-hour routine, he goes through 6 activities that give him the perspective he needs for the day. Hal recommends spending the first 10 minutes of your waking hour in silence. You may simply wake up and sit, appreciating the silence. Other ways to fulfill silence are meditation and prayer. For best results, Hal recommends that you get out of bed and choose a different place to sit in silence. If you choose to do that on your bed, you may fall back asleep. Affirmation is the practice of actively thinking to yourself and reassuring yourself that you are doing well and that you can steer your life as you want it to be. Too often, our mornings bring us preoccupied thoughts about what to do at work and millions of other things that are not necessary at the moment. Affirmation is a way to stop the automatic thoughts and think something deliberately and a way to start your morning in a positive manner. Visualisation is the act of closing your eyes and seeing in your mind’s eye all that you want to achieve in your life. You may visualise your perfect day or you may visualise yourself performing a certain activity that you want to succeed it. Visualisation is different from imagination. In visualisation, you need to bring into your visuals every detail of the story. E.g. if you are visualising drawing a sketch, you need to visualise the type of pencil and the amount of pressure you are putting on the paper. Exercise improves blood circulation and gets you going in the morning. Working out every day keeps you fit and healthy. Often, we don’t find time for even a quick workout once our workday starts. By evening, we are too drained to work out. Mornings are a good time for a session of exercise. The session doesn’t need to be a long program at the gym. It can be short 10-minute workout such as running a kilometre and a set of dips or pull-ups. Reading opens up the world to you. Keep a good collection of books from your favourite authors and read 10 minutes every morning. Your empty and well-rested mind is most receptive early in the morning. Make the most of it. However, be wary of reading junk content like film gossip or social media content. Your 10-minute reading session should teach you one step (just one step) in a new skill or a small new concept that you can try out that day. To create the word SAVERS, Hal labels the activity of writing as scribing. Writing can be for one of the following two things. First, you can do a quick 10-minute journalling where you write about what happened last day or what you plan to do this day. Writing can also be in the form a gratitude journal where you thank people around you for the good things that are happening to you. The other form of writing is when you are writing your own content for publication for the world outside, e.g. blog posts or books. Ten minutes spent in the morning can move the needle by 1 or 2 pages. For most people, mornings are a time for frenzy, as they get ready to go to work in a chaotic way. The author recommends getting up earlier and spending an hour in a quality morning routine which prepares you for the rest of your day.